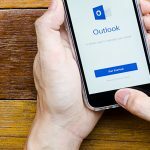 Microsoft just announced a series of updates that mean Outlook mobile for iOS and Android will soon be fully powered by the Microsoft Cloud for hybrid Exchange on-premises customers. With these Outlook mobile updates, customers will also receive support for management via Microsoft Intune, which is included in Enterprise Mobility + Security (EMS). Here’s what you need to know about the changes and how to take advantage of this new technology. Outlook mobile’s new architecture for mailboxes hosted by Exchange Server will be similar in design to Microsoft’s legacy architecture. But the service is built directly into the Microsoft Cloud using Office 365 and Azure, so users receive additional benefits like improved security, privacy, built-in compliance, and transparent operations that Microsoft commits to in the Office 365 Trust Center and Azure Trust Center. Processing information in the Microsoft Cloud means that users will soon have access to some advanced features and capabilities, including the categorization of email for the Focused Inbox, customized experience for travel and calendar, and improved search speed. The new architecture also enhances Outlook’s performance and stability, since it relies on the cloud for intensive processing and minimizes the resources required from users' devices. It also allows Outlook to build features that work across all email accounts, even if the underlying servers support different versions of Exchange or Office 365. More specifically, the new architecture should provide improvements when it comes to EMS support, advanced security features, unique device IDs, and unique Office 365 features that were previously not accessible for mobile users. Microsoft is looking for customers to participate in its Technology Adoption Program (TAP) before rolling out the new architecture to all users. To participate in the TAP, users must sign a nondisclosure agreement with Microsoft, be willing to share issues and feedback during the process, deploy preproduction Exchange Server software in production, and meet a couple other specific requirements. You can work with your Microsoft account team to nominate yourself for the TAP. Hi Annie, thanks much for sharing such an informative article. This is really a big news for iOS and Android users. Also, on understanding the "Benefits of the New Microsoft Cloud-based Architecture" is great help! Still I am not clear on "How to participate in the Technology Adoption Program", so what actually you mean by this? Cheers!